Jobu reminds Giants fans that, while the Giants may not have made the playoffs this year, it could be a lot worse. I know that, when the Giants started the year 0-6, I realized in the back of my head that they wouldn’t be playing a Super Bowl at home this year. They made a good run and finished a commendable 7-3 the rest of the way, but they just didn’t have enough to overcome that start. I haven’t written much about the Giants since they were eliminated but, with the Super Bowl around the corner, it’s time to remember when not making the playoffs was the norm. After this post, you might think twice before criticizing Eli Manning ever again. Let’s remember the era of Dave Brown, Kent Graham and the great Danny Kanell. 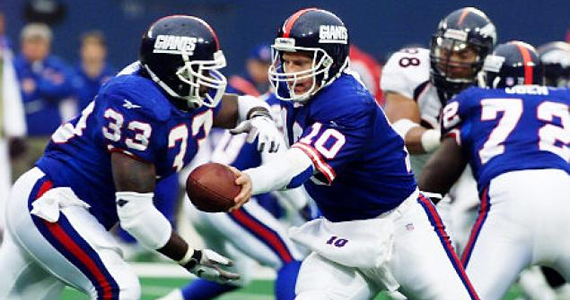 The early 1990s were a tough time for the New York Giants. Sure, they won Super Bowl XXV following the 1990 season, but things went down hill after that, and quickly. After 11 seasons as a starter, Phil Simms got benched in 1991 (more on this in a bit) and injured in 1992, and all of that limited him to just ten games in those two years. Although he’d play one last full season in 1993, that Super Bowl really ushered in the post-Simms. 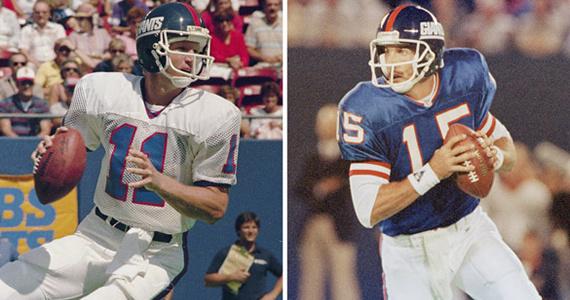 Jeff Hostetler led them to that Super Bowl win, was named the starter in 1991, Simms would call it quits two years later. But let’s get back to the Giants “preparation” for Simms’ departure. Bill Parcells resigned after the Super Bowl that year, and new head coach Ray Handley decided it would be a great idea to bench Simms, who was returning from the broken foot that cost him the end of the 1990 season, to start the 1991 season, because Hostetler had performed so mightily during the Super Bowl (did he really, though?). 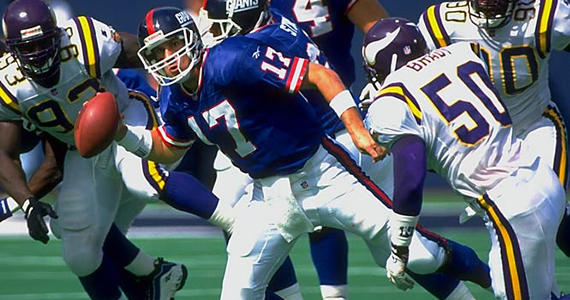 Hostetler managed to lead the Giants to seven wins in their first twelve games in ’91 (despite throwing only 5 TDs), before he broke his back in Week 12 against the Buccaneers. Simms ascended once again intot he starting role, but oddly enough, only won one game the rest of the way, despite throwing 8 TDs. Like any smart team, the Giants recognized that Simms was getting old, and more susceptible to injury, and that Hostetler wasn’t good at football, so they addressed the future of the position in the 1992 draft. Unfortunately, I think someone filed the “Future NFL Stud” players in the “Don’t Ever Draft Ever Because It Will Take Your Team Years to Overcome Drafting These Guys” folder, because the G-men ended up taking two terrible QBs in two different drafts that year. The first guy the Giants took was Kent Graham out of the Ohio State University (he had transferred there from Notre Dame). The Giants took him in the 8th round, which leads me to believe they never really saw him as more than a backup, or maybe a project pick. This makes his career progression as a Giant all the more baffling (you’ll see in a bit). There’s a reason the NFL no longer has more than seven rounds. I’m not saying Kent Graham is the reason, but he probably didn’t help things. The guy the Giants really mortgaged their future on was a 6’5″ QB from Duke named Dave Brown (pictured at the top of this post). Now, I’m not sure what the problem is, but Brown wasn’t in the April draft. He was forced to enter the Supplemental draft that year, which is a secondary draft for players who are ruled ineligible because of academic or other, more sinister reasons. I honestly wasn’t able to find out why Brown wasn’t in the normal draft, so we’ll save that tale for another day. (UPDATE: Apparently he just graduated early and didn’t want to play his senior year… that’s not exciting.) Anyway, the way the Supplemental draft works is that teams bid what round pick they want to use on a player. If they win, they get the player, but relinquish that round’s pick from the next April’s draft. The Giants bid a first round pick for Brown, whom they felt they could groom into a QB of the future. No one has bid a first round pick on a player since. Now, I’m not saying Dave Brown is the reason for that, but nobody else has the distinction of being the last person to be taken with a first round supplemental draft pick… just saying. The 1992 season started with Simms at QB, but a severe arm injury knocked him out for the year in Week 4. Hostetler stepped back in and went 5-4 in his nine games, but he was plagued with injuries all year long, which led to the kids taking over for a bit. That was not pretty. Graham ended up getting three starts that year, losing all three and managing only 470 yards with 1 TD and 4 INTs in the process. Brown was only used in a couple of games, and completed 4 of 7 passes for 21 yards. As we mentioned earlier, Simms came back for the entire 1993 season, and retired thereafter, so the Giants ushered in the Dave Brown era officially in 1994. Brown ended up making 15 starts that year, even winning six in a row to end the year. Rest assured though, that most of those games were won with defense and the running game. Brown only threw for 2,536 yards with 12 TDs and 16 INTs. Sadly, those 12 TDs would be a career high, despite the fact that he was the starter for the next two and a half years. Brown was exposed completely in 1995 and 1996, managing only 23 combined TDs while hurling 30 INTs. It was awful. 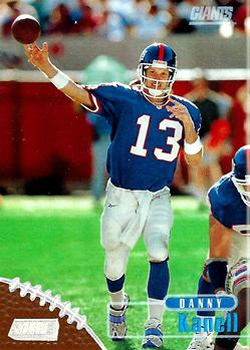 Anyway, Kanell was terrible, so the Giants dumped him ten weeks into the 1998 season, and they BROUGHT BACK KENT GRAHAM! Are you serious, bro? Did they not remember the first Kent Graham era? Again, through no skill of his own, Graham actually went 5-1 the rest of the way that year, and made it as the starter until nine weeks into 1999, when the Giants finally found a real QB in Kerry Collins…. OK listen. You put up with Kent Graham, Dave Brown, Danny Kanell and then KENT GRAHAM AGAIN in a seven year period, and Kerry Collins might as well be Joe Montana. The Collins era got us a Super Bowl appearance, and eventually led to the Eli Manning Era (with a little help from Kurt Warner), so you can’t be too mad at Collins. OK. Researching this post has made me legitimately sad. I think I had blocked out of my brain just how bumbling the Giants front office was during that period. That they managed to make the playoffs a couple times in the 90s was damn near a miracle. I’ll never complain about Eli Manning again. At least until after Week 1.